Studying all the nuances of the companies that provide access to foreign financial markets, many novice traders make one serious mistake. They believe that online broker reviews are one of the most important parameters for finding a reliable trading platform. Unfortunately, this is not true. Often experienced traders do not read comments, reviews, etc., knowing full well that many of them are written by professional copywriters. It can be both positive and negative reviews of “customers” (the first is ordered by the owner of the web resource, and the second is ordered by its competitors). In order not to become a “victim” of fraudsters, you must carefully check all available information about the broker. This will provide an opportunity to make the most objective description of the company of interest, and then decide whether to open a trading account at the site in question. The presented review of the well-known broker SimpleFX will help you to understand what parameters you need to pay attention to in order to determine how the company that interests the trader meets its requirements and financial capabilities. The broker was registered on the islands of Saint Vincent and the Grenadines in 2014. A firm known on the global financial market, despite the presence of negative reviews in the network, managed to create a decent customer base. The administration of the service provided an opportunity to conduct operations with popular cryptocurrencies and other financial assets, the number of which is constantly increasing, in accordance with the situation in the global market. The applications and platforms (MetaTrader 4, Mobile) used on SimpleFX are a guarantee of prompt execution of trading operations and the security of the company’s clients. At the same time, a trader can use both a stationary computer and mobile devices for his activities. Clients of the broker can at any time withdraw their money from the deposit, regardless of the situation in the global financial market. To ensure their safety, the administration of the trading platform uses separate accounts in reliable financial and credit institutions. ● Protection against negative balance. ● A large number of methods of payment of funds, which are carried out under the control of the encryption machine. One of the main drawbacks of this broker is the lack of organizations that control the work of this participant in the global financial market. And the administration of the trading platform should solve this problem as soon as possible. Serious traders (investors) will not risk registering a login to SimpleFX as long as the company does not have regulators and licenses confirming that it has the right to provide financial services. The official website of the broker provides a whole section for beginner traders. His main task is to help the beginner understand how financial markets work, deal with terminology, and also explore all the nuances of this trading platform. ● General questions about the Forex market (how to open an account, what needs to be done to make a profit, who is a participant in trading, etc.). ● Description of the MT4 platform. ● Training materials on the VTC cryptocurrency. ● Terms of trade of the company in question. ● Information about available payments (how they are protected from intruders, how much time is needed to conduct monetary transactions, what documents the trader must provide to make payments, whether verification is necessary to complete the work on the site, etc.). ● FAQ (the rubric includes questions not included in the previous sections). For practical skills in financial transactions, you can use a demo account posted on SimpleFX. On the presented trading platform, the user can open a Bitcoin account or Forex account. If the latter practically does not differ from similar tools of competing companies, then the account for cryptocurrency has its advantages. It does not require verification, has no deposit restrictions, and the user does not have to pay a commission for conducting trade operations. Reviews made about SimpleFX often focus readers’ attention on this particular trading platform advantage. ● The size of the minimum deposit is not set (in some sources it is indicated $ 1). ● Account currencies – euro, Australian Canadian and American dollars, British pound. ● Islamic account – absent. ● Support – works around the clock, seven days a week. ● Bonuses, contests – no. 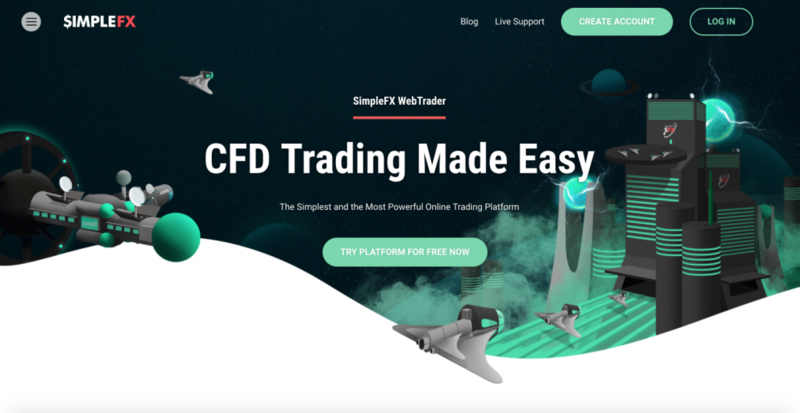 Judging by the reviews prepared by SimpleFX, most of the users of the resource believe that there are enough ways to replenish and withdraw funds on the trading platform. ● Debit and credit plastic cards. To work on the trading platform under consideration, its administration proposes to use: cryptocurrency, CFD contracts, currency pairs, indices, precious metals and commodities. Based on the analysis presented, it can be concluded that this brokerage company has real prospects for growth, which has a positive effect on its business reputation. But in order to reach the level of serious participants in the global financial market, the administration must obtain licenses from well-known regulatory agencies.